I am super excited to announce that Andrew and I are featured on the most recent issue of Engagement 101!! We have a two page spread in their “real proposals” section. 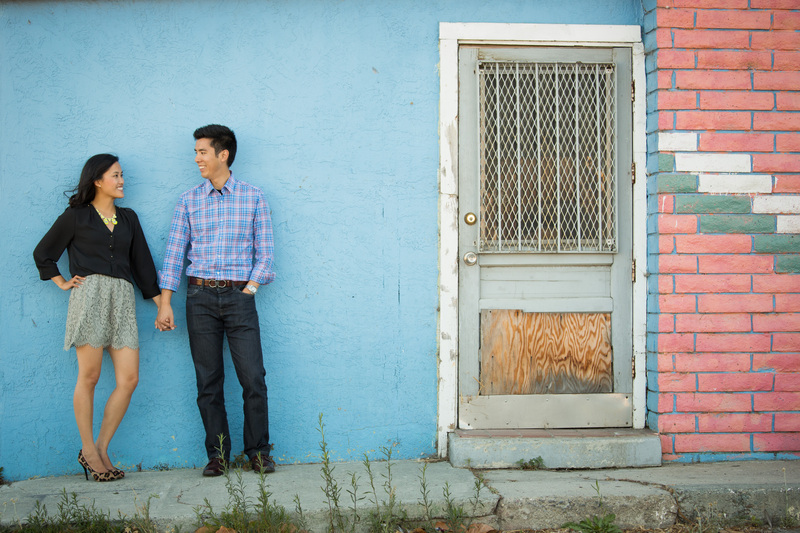 Our engagement photos were taken by Mike & Nat of Choco Studio, located here in San Mateo, CA. They are such a sweet and amazing couple to work with. We are so happy with the final photos. The original planwas to have our engagement session at Sutro Baths and Lands End in SF. Week after week the weather was not ideal, so we finally decided that it was time to consider another location. Mike and Nat provided us a few suggestions and instantly we fell in love with the landscape that Alviso, CA had to offer. After living in the South-bay for a few years I never realized that I lived so close to a place that had such picturesque character. Alviso, CA used to be a boating and shipping port for Santa Clara Valley – however it became a registered historical site. What I really loved about Alviso were the unique abandoned buildings, railroad tracks, wonderful marshland, and various walking trails. These are some of my favorite pictures from the engagement session. Check us out at your local Barnes and Noble store! as the slit detail provides comfort as well as elegance.